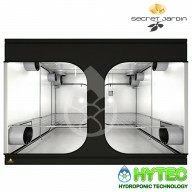 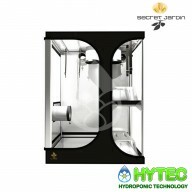 Secret Jardin has become the world leader in offering indoor growing rooms dedicated to indoor hydroponics. 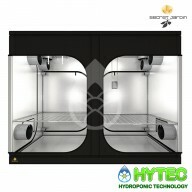 The range includes a wide choice, including DarkStreet and DarkRoom, available in several sizes and adapted to all spaces. 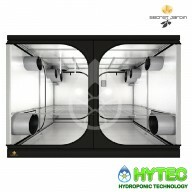 Secret Jardin has also developed specific culture chambers such as the DarkPropagator dedicated to cuttings, or the DarkDryer dedicated to drying, or the Crystal reflector tent for CFL bulbs. 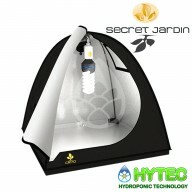 To view our range of Secret Jardin Tents in-depth, click on the sub-categories below. 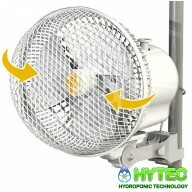 MONKEY FAN 20W OSCILLATING Compatible with tents: Tube Ø16 to Ø21 mm Does not fall to the ground Easy to install Easy to adjust in height Metal Grid Engine 100% Copper ..
SECRET JARDIN DS60 Dark Street 60CM X 60CM X 158CM Description : High quality tent made of the best reflective mylar Ø0.63" steel structure & tear-proof 190T canvas Compatible with any hydroponic materials Extensive set up of accessories included Main Technologies ..
Darkroom Propagator 90CM x 60CM x 60CM V3 The Secret Jardin DP90 Dark Propagator is a compact and highly cost effective tent perfect for all your micro and macro growing needs. 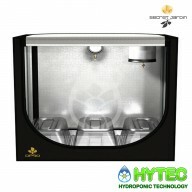 The Secret Jardin DP90 is an all in one propagation station suitable for propagation, growing and blooming. 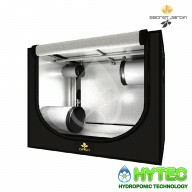 Mea..
SECRET JARDIN DS120 120CM X 120CM X 198CM V4 High quality tent made of the best reflective mylar with Ø0.63" still structure & tear-proof 190T canvas, Compatible with any hydroponic materials.Extensive set up of accessories included. 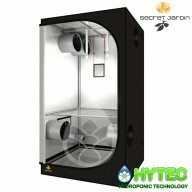 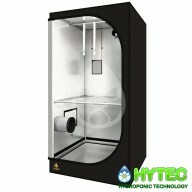 Main Technologies : ..
Secret Jardin DR60 V3 60CM x 60CM x 170CM New tubes, corners, Mylar & heights The Secret Jardin Dark Room is a premium quality grow tent. 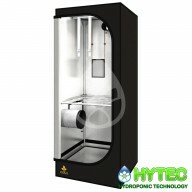 Purpose made to accommodate your chosen growing system; it provides the perfect environment for growing plants. 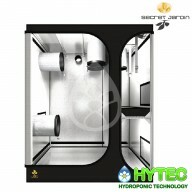 The five tube concept reduces spa.. 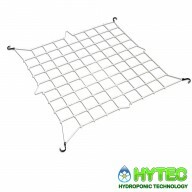 Description : Tent designed with highly reflective Mylar Diameter bars Ø16 mm and tear resistant fabric 190T Equipped for all equipment Includes numerous accessories Main Technologies : Main Fabric Mylar 210T Poles Ø16x0.6 mm - Steel Q195 - Galvanized Pastic..
Secret Jardin DR90 90CM x 90CM x 185CM V3 New tubes, corners, Mylar & heights The Secret Jardin Dark Room is a premium quality grow tent. 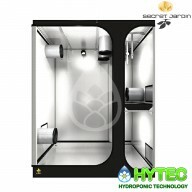 Purpose made to accommodate your chosen growing system; it provides the perfect environment for growing plants. 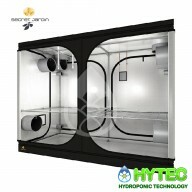 The five tube concept reduces spare tube st..
SECRET JARDIN LODGE L90 90CM X 60CM X 135CM V4 Description : Complete grow combination designed for low spaces Includes a multi-layered and multi-purpose room Ø0.63" steel structure & tear-proof 190T canvas Multiple socks and windows for all possible configurations Accessories ..
SECRET JARDIN DR150W 150CM X 90CM X 200CM V3 Professional grow tent made of the best reflective mylar with Robust Ø0.75" structure & tear-proof 210D canvas, Multiple socks and windows for all possible configurations.Extensive set up of accessories included &..
SECRET JARDIN DR120 120CM X 120CM X 200CM V3 Description : Professional grow tent made of the best reflective mylar Robust Ø.75" structure & tear-proof 210D canvas Multiple socks and windows for all possible configurations Extensive set up of accessories included Mai..
SECRET JARDIN LODGE L120 160CM X 90CM X 145CM V4 Description : Complete grow combination designed for low spaces Includes a multi-layered and multi-purpose room Ø0.63" steel structure & tear-proof 190T canvas Multiple socks and windows for all possible configurations Accessorie..
SECRET JARDIN DR150 150CM X 150CM X 235CM V3 Professional grow tent made of the best reflective mylar with Robust Ø0.75" structure & tear-proof 210D canvas, Multiple socks and windows for all possible configurations.Extensive set up of accessories included Main Technologies ..
SECRET JARDIN LODGE L160 160CM X 120CM X 198CM V4 Description : Complete grow combination designed for low spaces Includes a multi-layered and multi-purpose room Ø0.63" steel structure & tear-proof 190T canvas Multiple socks and windows for all possible configurations Accessori..
SECRET JARDIN DR240W 240CM X 120CM X 200CM V3 Professional grow tent made of the best reflective mylar with Robust Ø0.75" structure & tear-proof 210D canvas, Multiple socks and windows for all possible configurations.Extensive set up of accessories included Main Technologies : Main F..
SERCRET JARDIN DR300W 3.0M x1.5M x2.35M V3 Professional grow tent made of the best reflective mylar with Robust Ø0.75" structure & tear-proof 210D canvas, Multiple socks and windows for all possible configurations .Extensive set up of accessories included Main Technologies : ..
​ Secret Jardin DR240 240CM x 240CM x200CM V3 Description : Professional grow tent made of the best reflective mylar Robust Ø0.75" structure & tear-proof 210D canvas Multiple socks and windows for all possible configurations Extensive set up of accessories included ..
SECRET JARDIN DR300 300CM X 300CM X 235CM V3 Professional grow tent made of the best reflective mylar with Robust Ø0.75" structure & tear-proof 210D canvas, Multiple socks and windows for all possible configurations.Extensive set up of accessories included Main Technologies : ..